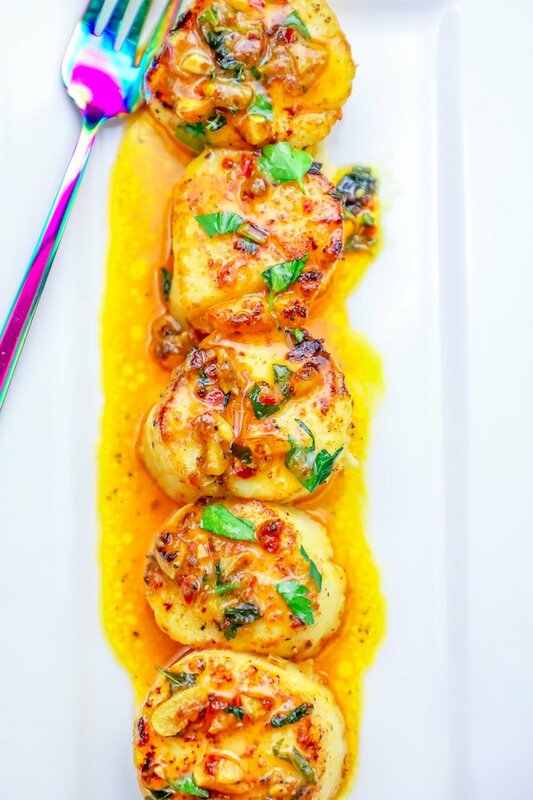 The Best 10 Minute Pan Seared Thai Chili Scallops Recipe is the secret to perfect pan seared scallops in a Thai chili sauce, bursting with lemon and Thai basil flavor for a Thai Restaurant quality scallop dinner in under 15 minutes – from fridge to plate! Scallops are a great low calorie and low fat choice that are packed with protein for dinner – especially during Lent. If you’re looking for a hearty, delicious, and restaurant-quality Thai Seafood dinner, these Thai Chili Scallops are the perfect easy and impressive meal – they cook in under 10 minutes (with a sauce!! ), are bursting with flavor without any hard to find ingredients, and make you look like a pro in the kitchen, regardless of cooking experience. This Thai scallop dinner can go from the fridge to the plate in just under 15 minutes – and is perfect for dinner parties, romantic evenings, or just a quick filling meal. While this Thai Scallop Recipe post is long, it does contain lots of information on the nutrition facts of the dish, substitute ingredient ideas, and tips to make it perfect, every time. 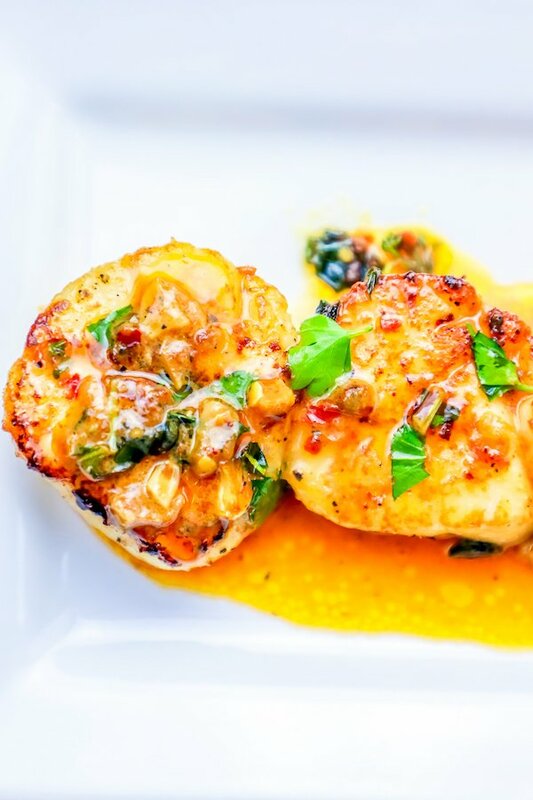 Please consider the post text and be sure to follow through my tips to ensure perfect pan seared scallops and an irresistible Thai chili sauce! Just take me to the Spicy Asian Scallops Recipe already! If you’re watching fat or cutting dairy, extra virgin olive oil or another heart-healthy oil whose flavor you love (and has a higher smoke point – coconut oil, walnut oil, avocado oil are all good additional options) is an easy swap. If you’re wondering what the difference between Thai Basil and Basil is, you’re not alone. Thai Basil looks a lot like basil – and while it can be used in place of basil and vice versa, they do have different flavor profiles. Thai basil has become a lot more easy to find in grocery stores across America than it used to be – but if you can’t find it, don’t worry, this dish is still delicious with basil. Thai basil has a bright citrus and slightly minty and anise flavor that basil doesn’t – so if you’re swapping Thai basil with basil, you might want to toss in a sprig of mint and a dash of lemon juice or a couple fennel seeds to get a similar flavor – however for a quick dinner, you basil will still give you an outstanding flavor. I used a Thai chili paste because I love the rich, spicy, and slightly smoky flavor – but there are numerous substitutions that work well in this recipe. Sriracha is an easy almost-even swap (you might want to use a tiny bit less sriracha sauce depending on your tolerance to heat), or add chili flakes + a dash of rice vinegar. You can also take the heat out completely and swap the chili paste for some soy sauce (or coconut aminos if you’re on a paleo or keto diet) for a saltier take on this dish that is incredibly delicious. If you’re looking for something sweeter, a sweet chili sauce gives a deliciously sweet (but not overpoweringly sweet) twist to this dish – orange chicken sauce, teriyaki sauce, soy sauce, sweet and sour sauce are also great options to use to replace the Thai Chili Sauce I made here – and all go great over perfect pan seared scallops. 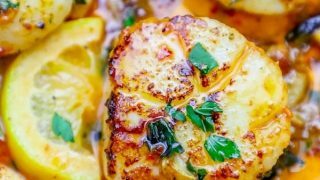 While this dish was created to spotlight the sweet and buttery flavor of perfect pan seared scallops, it is a delicious method to cook some other favorites as well – especially other seafood dinners. Using Shrimp Instead of Scallops – cook 1 lb peeled and de-veined shrimp exactly like scallops, until opaque. Cooktime can vary depending on size of shrimp, so watch to see when they are turning opaque and adjust timing based on the color of the shrimp. Using Salmon Instead of Scallops – sear top of salmon filet in HOT oil, then flip to finish skin-side down, and cook as listed in scallop recipe to create sauce. Salmon is cooked when it is no longer pink in the middle, before the albumin (the tiny dots of white – Salmon’s fat – that pop out of salmon when overcooked). Salmon filet size will change cooking time – for larger filets, you might need to add a couple minutes. Watch your fish to see how it’s cooking and adjust as needed. Using Lobster Tails Instead of Scallops – Lobster tail is a great swap for scallop – simply remove lobster meat from shell and cook as listed for scallops. Depending on the size of the tails, you might need to cook faster or longer – lobster tails curl slightly when cooked, so watch to see when they are turning opaque and adjust cooktime. Tofu – If you think this recipe sounds delicious, but want a vegan swap, tofu is a great alternative – it has a similar texture to scallops, soaks up flavors it is cooked with, and is quick to cook. Be sure to get a good, crispy and crunchy sear on scallop-shaped cuts or tofu (or cut them into strips) – since this will give you a meatier, smokier, and rich buttery flavor. Mushrooms – King Oyster Mushroom stems happen to look just like scallops – and have a delicious, sweet, meaty flavor that is perfect in this Thai Chili Sauce. If you can come by some from a local farm or specialty food store, they are an awesome swap that you can cook just as you would a scallop (again, a good sear on the outside is essential). If you can’t find King Oyster mushrooms, you can also cook this dish with cremini mushrooms, button mushrooms (both of which I like just whole, with stems removed) in this dish – or strips of portobello mushrooms, too! If you’re drying to try out King Oyster Mushroom stems, you can order them here. Perfect pan seared scallops can seem intimidating – but I am sharing my best tips to get the most amazing pan seared scallops, ever! These tips work with any scallop recipe, so be sure to save this post for later! Scallops really benefit from the delicious buttery seared crunchy crust – which won’t properly form with wet scallops. Be sure to pat scallops dry before searing to get the best results – obviously, scallops are a very watery shellfish and will still be quite moist to the touch, but we want all excess water patted off. If you watch Top Chef like I do, you know that using frozen scallops can cause quite a stir. Unfortunately, to get the freshest fish isn’t easy for those who live far from the ocean (like me in Northern Colorado) – so I opt for fresh-frozen. Let scallops defrost naturally in the refrigerator. I like to put them on a plate, layered in paper towels, to get some of the excess ice off the scallops, fast. Scallops will give off a lot of water when defrosting, so be sure to have something to catch all that liquid so it doesn’t go all over your fridge! Cook through, but Don’t Overcook. 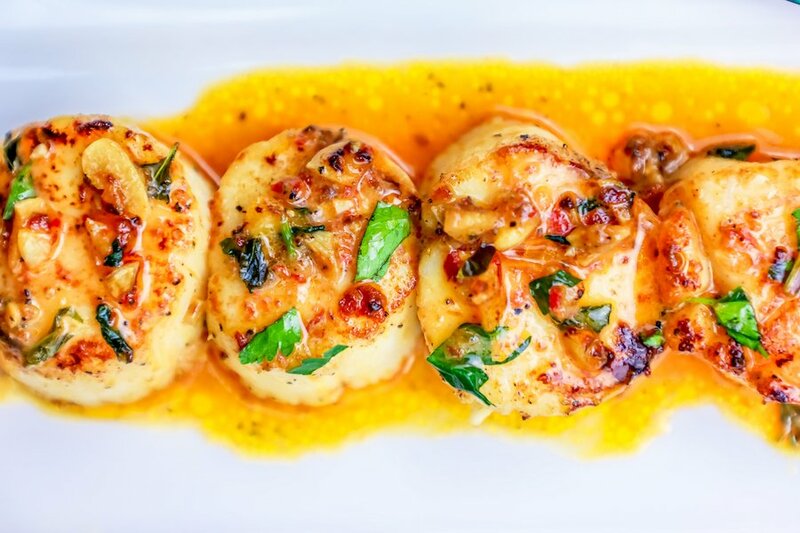 While some people are hesitant of the springy texture scallops offer, most of the complaints about Scallops come from overcooking. Like shrimp and lobster, scallops can take on a fishy taste and gummy, tough texture when overcooked. Scallops should be springy to the touch, but not jiggly like jello. It should feel like the fleshy part of your hand between your thumb and finger – not slippery and loose like it is raw, or firm like a well done steak. Keep the pan scorching hot. Scallops are best when cooked hot and fast – giving them a lovely, crunchy crust, and cooking the meat all the way through without drying it out or losing it’s liquids. Don’t form sauce until the last few minutes. 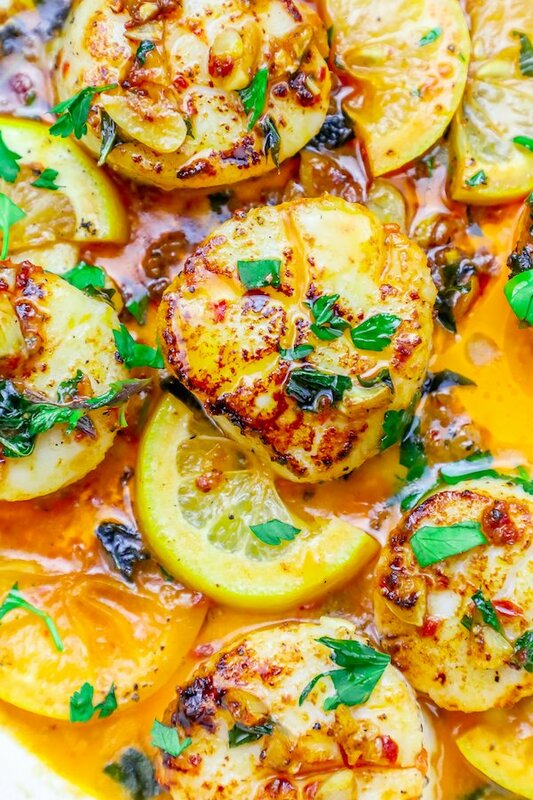 The bulk of the time for this recipe is spent searing the scallops – with some time to soften and brown the garlic and lemons – but if you add the chili and Thai basil too early, it can burn or get bitter. The lemons flavor will cook quickly into the sauce, but can turn bitter if left in the sauce for too long. If you love this 10 Minute Pan Seared Chili Thai Scallops Recipe, be sure to look over some of my other favorite easy seafood recipes – these are family pleasing seafood dinners that take less than 30 minutes – many of them are even one-pot dinners! This recipe is insanely easy – but there are a few tried and true tools that make this dish super simple and perfect, every single time. 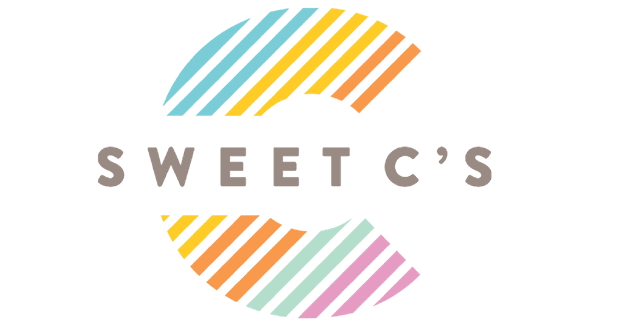 The links below are through my Amazon Affiliate program – purchasing through my links provides me with a small commission at absolutely no extra cost to you, which helps me continue to provide free recipes you will love here on Sweet C’s! A nonstick pan is essential for making perfectly seared scallops – I prefer to use ceramic coated pans, as they are naturally nonstic and don’t leach harmful chemicals into your food – plus they are a breeze to clean! Get my favorite here. I love chili paste for all sorts of recipes – it gives a rich, spicy, and almost smoky flavor that is an awesome accent to seafood, chicken, and beef. I prefer this brand – but you can also swap it for sriracha or my favorite sweet chili sauce! While Thai Basil isn’t critical – I LOVE the flavor it gives this easy dish. Thai Basil is usually available at most American grocery stores, but you can buy it worry-free here. While this spatula isn’t required, if you’re not used to cooking fish often, this spatula makes flipping fragile fish much easier! Heat butter in pan on high heat until melted and lightly foaming. Pat scallops dry with paper towel and generously season scallops with salt and pepper. Add scallops into pan, with space in between so they can crisp. Add garlic and thai basil and stir quickly, let lightly brown and become fragrant, do not let burn (about 2-3 minutes). Add lemon slices, chili paste, and stir. When scallops are still springy to the touch, but bright white and opaque and browned on both sides, serve and top with sauce. I made your recipe using avocado oil as you suggested and regular fresh basil (couldn’t find Thai Basil) It was absolutely delicious. I’m a not a big fan of scallops but this was a winner. I added a few large shrimp for fun. Highly recommended this recipe!! I was looking for a different variation of the traditional scallop recipes. I always have Sambal on hand and I happened to have some left over Thai basil. I’m not a lemon guy so I used limes instead (a little more Thai-ish!?) I also wanted to deglaze the pan as I didn’t have any sauce left so I opened the fridge and had a little bit of saki leftover from sushi night to use! Turned out to be my favorite scallop recipe ever! Thanks for a inspiration! My mouth is watering just looking at those scallops!! Can’t wait to make this! 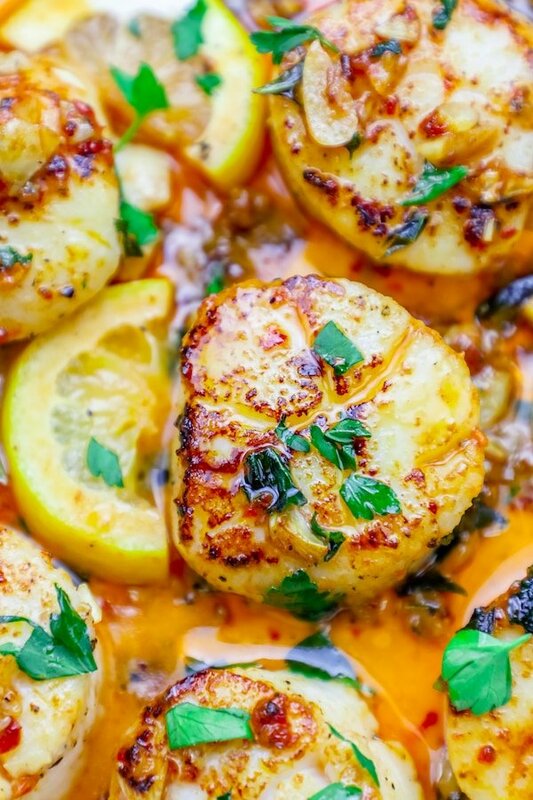 These are the perfect scallops we can’t get enough of these! Perfect flavor and thanks for all the info as well! Seriously, these are the best scallops ever. So much flavor! mmm..this looks incredibly delicious!! Can’t wait to try it! Delicious! I used chili garlic paste and roasted some asparagus to go with it. Thanks for the recipe! The amount of sodium in this is astounding – REALLY??? I did a variation of this with what I had in stock, and it is amazing! I would not have put chili sauce and scallops together, but I sure will from now on. Quick and delicious! Thank you! Where is the recipe? Nice pics, lots of ads and advice but no recipe??? Elizabeth, the recipe is at the bottom of the page, just as I have noted towards the top of the recipe. I add lots of tips and info into posts because I am trying to help get across all of the information I usually get in comments, so you’ll just need to scroll to the bottom of the post. I’m sorry, but where is the recipe? All I see are links for ads. This looks super yummy! My plan is to make this for our first truffle dinner of the season.So excited to make this successfully coz i often fail First time.